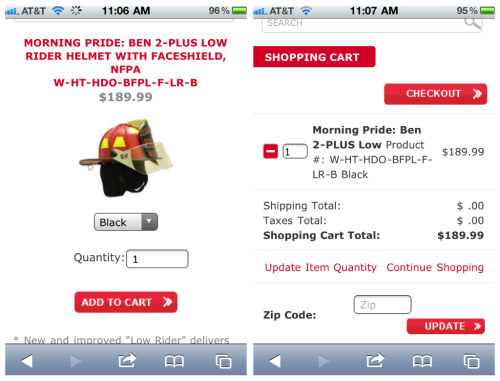 On Scene: TheFireStore.com on your SmartPhone & a Discount for Blog Readers! TheFireStore.com on your SmartPhone & a Discount for Blog Readers! A few months ago we launched our Mobile Site for TheFireStore.com, making shopping & browsing from your SmartPhone all the more easy and convenient. Truth be told, we saw a need, and knew that many of our customers were accessing our site via their mobile devices as it was. In the last year alone, customers visiting our website from their iPhones was up by 953%, and customers using their Droids were up by 2,307%. We felt it was time to make a web experience that was easier to navigate and enjoy using your handheld device. As you can see, the content renders on your smartphone in a simple manner, with easy navigation, categories, and a one-click to call customer service if need be. With our mobile site, there is no need to even pinch the screen to zoom in and out to read the site content. Oh, and checkout? That's simple, too. Basically, you can do everything from your mobile device with the exception of our Build-it, See-it, Buy-it program for shields & badges since this requires Flash not yet available on iPhones. We're hoping to have an app for that program to be usable in early 2012. It took a team of talented programmers to bring about our mobile site, which we're very proud of. It's been a huge success, and the wonderful customer feedback has proved it to be a step in the right direction for us. If you're a mobile shopper, we've got a special discount for you! Please enjoy $10 off any order of $75 or more using promo code MOBILE10 upon checkout when you use TheFireStore Mobile Site. Offer expires 10/14/11 at 11:59pm EST. 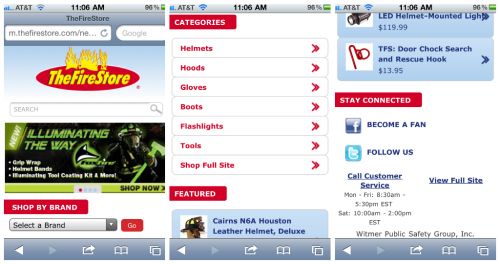 So tell us, do you browse TheFireStore on your smartphone? If not, what are you waiting for? Yup. Doing it right now.